New documents demonstrate that President Donald Trump’s commission on election integrity was definitively full of hot air. Emails from the commission, coined the “voter fraud commission,” reveal behind-the-scenes exchanges aiming to make something out of nothing. 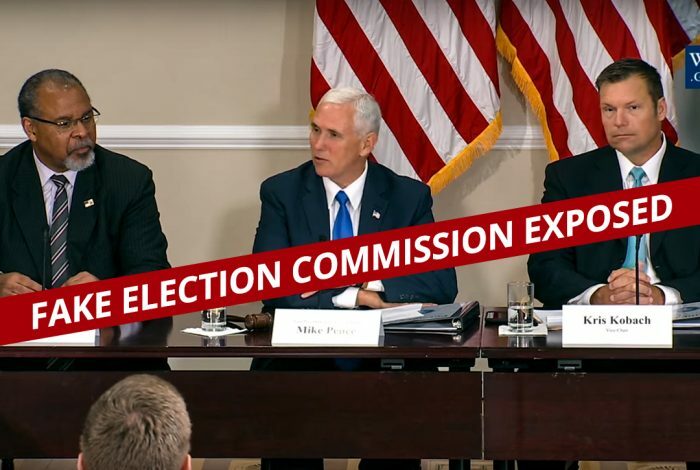 The Commission, created in May 2017 and disbanded in January 2018 was a project created to address what the president, and others, alleged was a national voter fraud crisis. A bipartisan group of commissioners began investigating the issue. Democratic members soon found themselves excluded from essential communications and decision-making. Maine Secretary of State Matt Dunlap was among the Democrats who served on the Commission and was denied access to documents. Working with the nonprofit American Oversight, he secured records from the Presidential Advisory Commission on Election Integrity that demonstrate the extent of certain commissioners efforts to find proof of voter fraud — despite evidence to the contrary. Dunlap made the records available to the public Friday. A review of the papers shows extraordinary efforts to substantiate the claims of widespread voter fraud made by commission co-chairs Kris Kobach and Vice President Mike Pence — but little actual evidence of a problem. A “Staff Report” summarizing the group’s work included a section called “Evidence of Election Integrity and Voter Fraud Issues” — which commissioners struggled to fill. 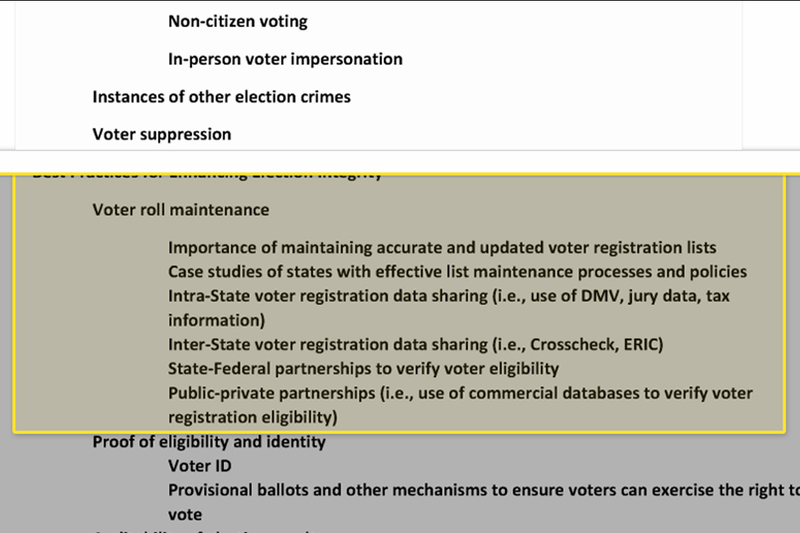 A list of bullet points mirror the issues that voter fraud advocates often turn to: double voting, non-citizen voting, and more. Few of these are actual issues at any scale, experts say. “The Commission had a predetermined agenda and sought to promote unsubstantiated claims of vote fraud,” Kristen Clarke, president and executive director of the Lawyers’ Committee for Civil Rights told WhoWhatWhy by email. The Lawyers’ Committee was among the first organizations to sue the Trump administration over the Election Integrity Commission. Central to the commission’s strategy to prove voter fraud was data collection from states’ Boards of Election. The commission — using the same logic as Kobach’s fundamentally flawed Crosscheck system — wanted to compare voter registration records to identify cases of double registration, a relatively common administrative oversight. When people move, they may end up being registered in more than one place. Rarely does dual registration lead to double voting. Few entities or people have access to voter registration rolls — depending on the state, they aren’t always available for public review. Request for access from the federal government represents an undue intervention into the administrative domain of states, Dunlap said. The system is decentralized by design — at least in Maine, the law would prevent him from turning over the data. Many states outright refused the request from the commission, Maine among them. Moreover, the documents show how the commission worked with Republican party officials to circumvent state election officials. Alabama was among the states that refused to hand over the requested data, which would violate state law. Nevertheless, the Alabama Republican Party was quick to intervene, writing to Kobach that the director of the party would “initiate this process immediately” and secure full voter registration records. The secrecy drove Dunlap, among the few Democrats who served on the commission, to file a lawsuit for the withheld documents in November 2017. WhoWhatWhy spoke to Dunlap several months ago. In our exclusive interview, he suggested that the commission had disbanded to avoid being exposed as a sham. His colleagues began to exclude him from key conversations early on. Kobach published an op-ed in Breitbart News, which Dunlap criticized. Soon after, communication stopped. Dunlap continued to request basic documents — like schedules — to no avail. He turned to the courts and filed the lawsuit. Two months later, Trump disbanded the commission. The courts finally ordered the commission to disclose materials by July 18, 2018. The documents Dunlap received are now available online. In a letter to Vice President Pence and Kobach, Dunlap explained that he joined the commission with the expectation that it would represent an honest effort to evaluate the problem. He found, however, that the commission’s project was “not to pursue the truth,” but rather to legitimate, at any cost, Trump’s allegations of illegal votes cast by millions of voters. Dunlap found in his review of the documents that the sections on evidence of voter fraud were “glaringly empty.” He wrote that the dedication to finding voter fraud where no legitimate threat materialized represented a “troubling partisan bias” — an argument that critics have floated since the commission’s inception. The commission nevertheless posed a real threat: Even unsubstantiated, claims of voter fraud have played no small part in encouraging suppressive voting laws in states nationwide. “The Trump voter fraud commission was flawed from the start, and a dangerous effort to justify the president’s lies about widespread voter fraud,” Stephen Spaulding, director of strategy and external affairs at Common Cause told WhoWhatWhy by email. Many criticized the commission from the start as a deeply political maneuver to address a manufactured problem — fake news at its very heart. The documents show how the now-defunct commission risked kicking eligible voters off the rolls. From ever more strict voter ID requirements to the abuse of voter challenge laws to increased rates of voter purges, allegations of fraud have been among the many factors to motivate conservative lawmakers and activist groups in their efforts to suppress the vote. While a presidential commission investigated a non-issue, few resources have been allocated to address the intensification of such practices. Correction notice, 8/7/2018, 3:13 pm: An earlier version of this article incorrectly referred to Maine Secretary of State Matt Dunlap as “Mike.” We regret the error. 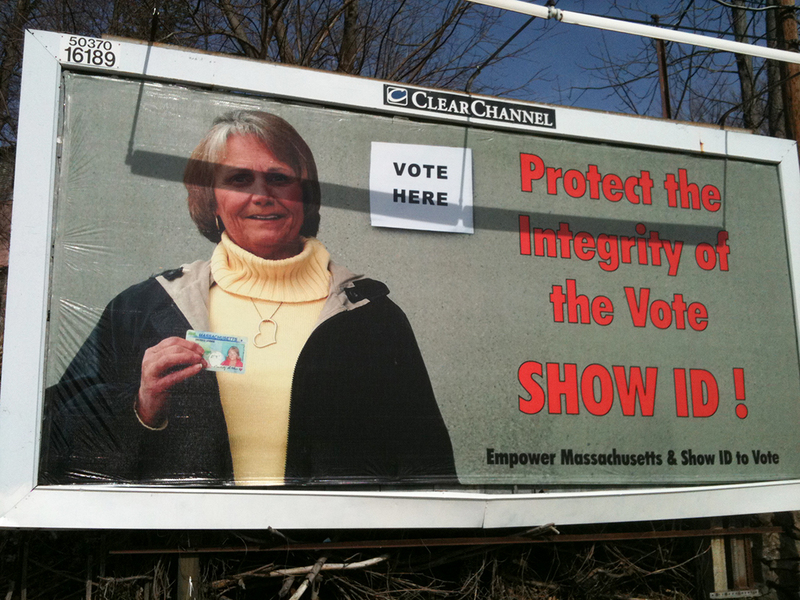 Related front page panorama photo credit: Adapted by WhoWhatWhy from Advisory Commission on Election Integrity (The White House / YouTube).